One of the biggest events of the year, the Disney World of Tech, has now come and gone. Much like Disney World, CES is full of imagination—and due to its size and scale—it’s nearly impossible for one person to see it all. With that said, great brands, products, experiences, and stories still find a way to stand out. In this blog, we will review some of the top highlights that came out of CES 2019 in the world of Artificial Intelligence (AI). It's a Bird...It's a Plane...It's my Uber? Uber and their efforts to bring autonomous flying cars to the market by as early as 2020 came closer to that reality. 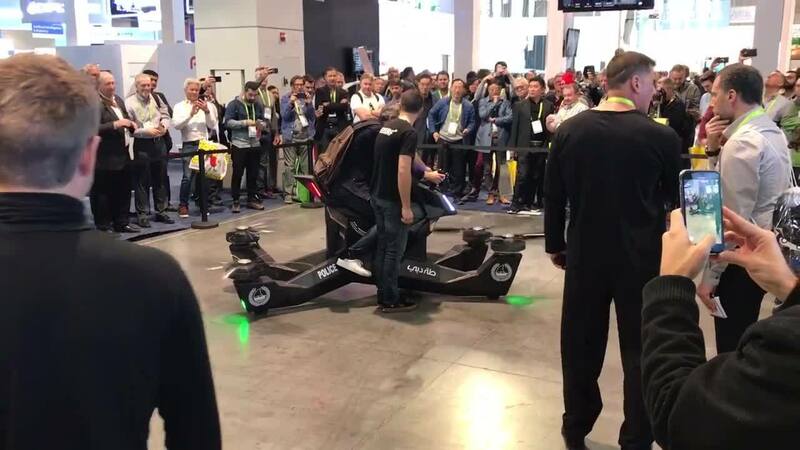 This year we got the chance to see Bell’s (the company partnering with Uber on their flying car project) Bell Nexus in all of its glory on the ground floor of CES. Although Uber plans to have these black beauties flying on their own eventually, the plan is to have trained pilots for the launch and Uber has not yet landed on a date for a fully autonomous experience. Also on display at this year’s CES were a variety of Hover Bikes including, the proof of concept bike for the Dubai Police Force who plans to roll these out over the next few years. As you can see in the video, there were no bikes hovering around the CES floor, but we were able to get an idea of the power through the sounds of the fans. Watch your head. CES 2019 brought back a familiar face to the AI community and most of the world. The discussions and interviews were focused on what’s new with Sophia, as well as the criticism Sophia has gained since she went viral in 2017 on the overhype and many realizing that Sophia is nothing more than a chatbot with a face. Dr. David Hansson, CEO of Hanson Robotics, uses words like “evolve” and “alive” to describe Sophia, often falling into the ever attractive anthropomorphic trap. Dr. Hanson believes humanizing machines is the best way to build human to machine trust. In addition, CES brought the introduction to Little Sophia who is planned to being sold to homes around the world to help educate and entertain children. Although a little creepy, only time will tell if these human-like machines will be coming to a neighborhood near you. It was impossible to walk through CES without seeing the endless applications for Machine Vision. Companies like Kepler are focused on using Machine Vision (MV) in elder care to hopefully obtain better emergency response times and better data around what may have happened to a non-responsive victim, by analyzing human movements and stress signals. There are also companies like Gorilla Technology Group who are using their MV capabilities to help support smart cities efforts, by using MV to help identify public safety issues, traffic patterns and license plate data to track kidnapping and missing persons in real-time. Through all the examples and companies flexing their MV capabilities, it’s clear that Machine Vision is here to stay and already providing enterprises with valuable insights and support. There was no shortage of Smart Home devices with many brands showing off their connected technology to improve and connect the in-home experience. Unfortunately, Alexa still won't do your dishes, but with GE, Samsung, and other leading brands jumping into the race, we will see these capabilities collaborate more and more in the coming years. Some of the most hard to capture data can be consumer data from in the home, the growing number of products and capabilities looks to be trying to address this. It would seem like the leading brands like Google, Amazon, Apple, Samsung, Sony, and more are in a race to have a clear picture of how their products are and can be used better. Smart cities, weather prediction, elderly care, and public safety are just a few of the leading focus areas of responsible AI on show at CES 2019. There is a growing need and expectation to build trust and have transparency on how AI is created and used. Brands like Intel and IBM featured a number of partnerships and AI projects that are focused on providing positive impacts and is part of a growing trend and focus for many AI start-ups and enterprises at CES this year. As the AI adoption rate rises, brands will be responsible for building trust with their consumers and ensure their efforts are providing a positive impact. It’s clear that brands and consumers are still working their way through the possibilities and realities of AI. There is still a need for brands to help educate consumers and with more and more stories on how AI is already impacting industries and enterprises all over the world, less of a need to over hype. As Ginni Rometty, CEO of IBM reminded us during her CES keynote that “data will be the world’s greatest natural resource” - she went on to explain that today we have collected and analyzed less than 1% of the worlds data that we are putting out there. In a nutshell, the future is full of data and an endless well of opportunities for AI.